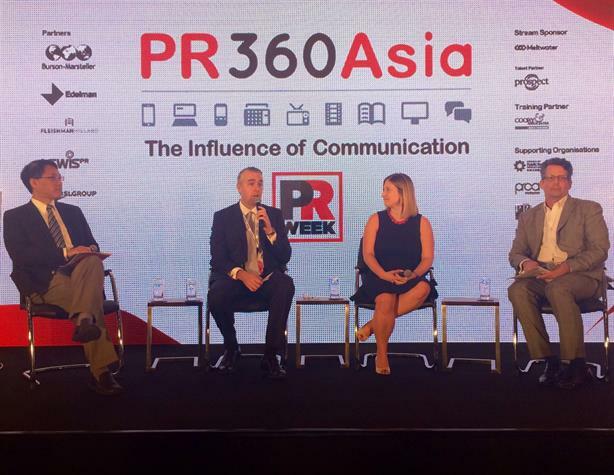 The first two sessions at PR360Asia brought senior clients and agency heads to the stage to discuss the changing nature of the industry and the skillsets needed to cope with today's challenges. More than 150 delegates descended on the JW Marriott Hong Kong for a day of learning, networking and debates at PR360Asia. The first session of the day was a panel discussion, moderated by CEO of HKSOW, Vincent Wong, included Stephen Thomas, group head of corporate communications at the AIA Group, Jacquelyn Drozdoff, director of corporate communications for Asia-Pacific at Dow Jones and Walter Jennings, newly appointed VP of corporate communications at Huawei International. The environment today is one that presents both great challenges and opportunities for the communications industry, said Thomas. "We are interacting both internally and externally with more people and parties than we ever have in the past. Perhaps the biggest challenge for a communications professional today is controlling the message the company presents, said Drozdoff. "Now, any employee can hop on to Twitter, Facebook and LinkedIn and make a comment that may or may not be beneficial." Which is why, when it comes to building a community of brand ambassadors and advocates, companies must not overlook the importance of internal communications. "Be visual and personable... communicate with staff in a manner that keeps them engaged and inspired enough to be brand ambassadors," she recommended. These communities are your insurance in a world where you simply cannot control everything, said Jennings. For multinational companies, it gets even harder, he added, because something that plays well in one market could backfire in others. It is here, where you can't control or watch everything, that the social community and reputation you've built around your brand is a poweful thing. "If there's an outlier talking trash, the community comes out and protects you," said Jennings. "And social can be a brilliant way to solve problems, turning even more people into advocates." The best protection for a company in this day and age, added Drozdoff, is really to just be transparent as the aspects the social community values most are authenticity and honesty. "The more transparent, the better." Being true to your values, with no gap between what you say and how you act is really the best way to win over both internal and external stakeholders, agreed Jennings. Ultimately, the best media is earned media, where the audiences are the storytellers for you. "You create the framework, and then step back and let the audience create," he said. Which is not to say companies are about to replace agencies with their social communities. "I want smart, creative ideas and agencies are very well-placed to do that," said Thomas. "Great ideas that are not tactical but are strategic and linked to the business." Agencies should also be proactive with these ideas, said Drozdoff. "Not just on specific projects I've commissioned but to come to me with ideas." This evolution towards creativity is one of the biggest changes the agency heads have seen, agreed the second panel of the day. This session, moderated by Damian Coory, MD of training consultancy Coory & Associates, brought together Tim Sutton, chairman of Asia-Pacific of Weber Shandwick; Angelina Ong, president of Asia-Pacific for Cohn & Wolfe; J.J. Carter, president of FleishmanHillard US West, Canada and Mexico; and Scott Kronick, president Asia-Pacific for OgilvyPR. "The expectation that we deliver creative, not just as an output but as a mindset, and how we measure what we do and the type of skills needed to achieve all this would be the most profound change I've seen over the past one to three years," said Carter. Sutton however believed that the most profound change for the agencies took place five years ago with the disintermediation of the media. "Our clients are now able to talk directly with audiences, which is an opportunity and a huge risk as well." What hasn't changed, he added, is reputational goodwill. "Ultimately, content that leads to engagement has to lead to some impact on the corporation's reputation." But the measure of this impact is the industry's weak spot, acknowledged Kronick. "Whoever figures out how to measure effectiveness, is in the sweet spot and will win"
As yet, there still isn't a definitive measure of effectiveness, said Carter. "We are experimenting with one in healthcare though that determines the size of the market we're helping to condition for sales. It's more narrowly focused than awareness, impressions or basic engagements." Until the perfect yardstick comes along, the industry will have to fall back on basic guidelines. "We talk about content mindfulness," added Carter. "We ask, 'Is what you're publishing valuable to the audience? Is it authoritative? and Is it something you want to share?' If you can't answer yes to all of this then hold off." The need to have a team that's aware of these issues and can think on their feet, both creatively and maturely, makes talent an issue that is front and centre for the industry - as it has always been. The biggest evolution however, agreed the agency heads, is a call for greater flexibility than ever before. "So much of great talent now has gone freelance, and they really enjoy it," observed Carter. "By 2020, 40 per cent of our workforce may not be full-time and the agencies will have to get used to it." The truth is, said Ong, there is a full-on war for talent in Asia and no one can afford to be blinkered or have prejudices. "I'm often asked if I advocate female leadership, just because I'm a woman. I don't. I advocate any talent regardless of gender, age or race, so long as they have the skills needed." But, she added, it would be a shame for anyone to ignore and not tap into the vast female talent pool, she added. "Workplaces have to be flexible enough now to adapt to millennials, women, people with disabilities... being open to diversity is the only way to have the best talent."